So that someone at the station—presumably radio anchor Ebro—fixed his fingers (or told a lowly intern) to tweet out an inquiry asking folks whether black women have an attitude problem hurts this native New Yorker. The line of inquiry is so old and tired, and a cheap way to kick up dust and get people riled up about an issue that's been debated, dissected and explored to death. And since most people are binary and won't go beneath the surface to discuss the unique set of challenges that black women face, the tweet will likely only pit black men against black women. Plus, the station had the audacity to upload a photo of first lady Michelle Obama alongside the tweet, with an “attitude-esque” expression on her face. The station deleted the tweet soon afterward. Ebro appeared in a quick video clip posted to Twitter acknowledging the controversy that the tweet kicked up. 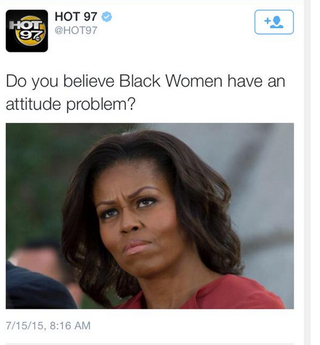 In the end, the tweet pitted black women against Hot 97 and, hell, black people against Hot 97. Check out the Twitter firestorm that Hot 97 brought on itself below. Ebro posted a few tweets in response to the ire he's no doubt getting about the post. He argues that he was merely trying to discuss the pesky stereotype that plagues black women and that he wasn't saying that he agreed with the notion that black women have attitude problems. We'll take Ebro at his word. But a more productive way to initiate that discussion is to acknowledge that it's a dated, played-out stereotype that you want to revisit and are attempting to explore from a different angle. But Ebro, find that angle before you start tweeting.